Break out the tissues, it looks like the final days of Fifth Harmony are here. 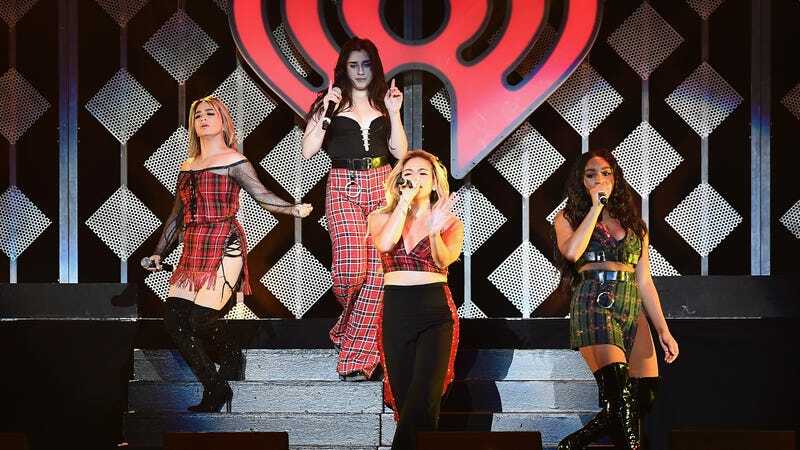 Last year was rough for the X-Factor-bred girl group, as their third album, 2017's Fifth Harmony, didn’t produce a single hit—perhaps because it was their first full-length recording since Camila Cabello left 5H (not only was Cabello the fan favorite, but her solo debut, Camila, went No. 1, as did her hit “Havana.”) It might be that the four remaining members, Normani Kordei, Ally Brooke, Lauren Jauregui and Dinah Jane, might be viewing Cabello’s success with plans to plot their own solo career paths. R.I.P. On Wednesday, rumors surrounding Kordei came to light—alleging she signed with the songwriting and publishing company Stellar Songs. If the hot gossip is to be believed, that makes Normani the third member of the (now) four person group who might be preparing for a post-Fifth Harmony career. In January, Ally Brooke released “Perfect,” with the German DJ Topic, her first solo endeavor outside 5H. In 2017, Lauren Jauregui of the group joined forces with Halsey on the “Him & I” singer’s queer love anthem, “Strangers.” Jauregui is also rumored to have signed a deal with Columbia Records. The only member without plans for a life after Fifth Harmony seems to be Dinah Jane. She, however, did record a Christmas song with “Burning Love” singer Leona Lewis last holiday season, so who knows what her plans are? The writing on the wall appears to be that the days of Fifth Harmony are coming to a close. To ring them out, I recommend revisiting 2016’s “Write On Me” (below) for tropical vibes in the middle of the winter, or whenever you need them. I’ll never forget you Fifth Harmony—even though, I guess, you’re still here. Guess Which Body Part Halsey Broke After Telling Fifth Harmony “Break a Leg?"